We moved to Livingston, Texas. We now are residents of Polk County. Polk County happens to be the poorest county in Texas. Edonna and I have already decided that when we are there we will be do our best to improve our new community. Home base the Rainbows End RV Park. This also happens to be the headquarters for the Escapees RV club. We decided to join for the mail forwarding services as well as discounts on RV parks. This is a neat community. We happened to be there to help celebrate the 40th anniversary of the club. We saw the time capsule opened at this event. This park caters to the older set. I think we were part of a small group of 5 who were under the age of 60. Luckily, Edonna and I can hang with anyone. We were warmly greeted by all that we met. We were there for the business of becoming Texans. They make the process relatively easy. 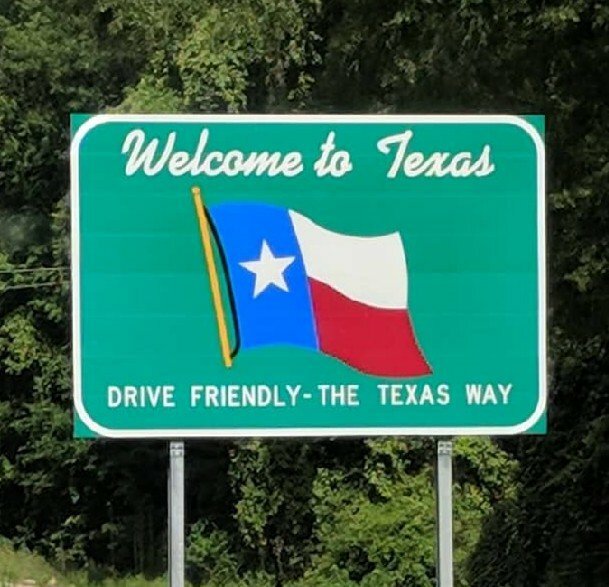 Once you have your Texas address in hand (provided by Escapees for our mail forwarding), you first get your vehicles inspected. This was a painless and not very expensive process. It took 15 minutes and $14 later we were off to the Tax Office to register our vehicles. I was in a line of 2 people so this was also a quick process. I can tell you that these two issues would have taken all day in DeKalb County in Georgia. We hit our first roadblock at the driver’s license office. The line was out the door. After waiting 2 hours we were told that they addresses on both registrations did not match so we were not granted a driver’s license. We went back to the Tax Office and got that fixed. By then is was after 4 pm. The driver’s license place closed at 5 pm so we decided to call it a day. We went back the next day and only had to wait 30 minutes. We now have our driver’s license. It is just a piece of paper with your picture on it. The real license will come in the mail within 30 days. Compared to the process I had to follow when I moved to Georgia this was easy. We also decided to get our RV weighed while we were in Texas. Our RV club offers this service at a very low price. The best thing is they weigh you by your axle. It is very important that you are not overweight by axle so that you don’t have issues with sway or worse, tire blowouts. I am happy to say that my obsessive, compulsive repacking of our rig had a benefit. Our front axles are under weight and have the same amount of weight on each axle. The rear axles are also under weight and the weight distribution is off by 150 pounds. Chris stated that she has never seen such good weight distribution in new RVers who full-time. She was completely impressed. We are ready for the next leg our our trip. We have a few more days in Texas to rest before we make our trip north.